This is a compilation of several lists I found online. Since I wrote this blog, I have discovered a lot more that are not listed. However, they can be found on Pinterest with the rest of these. If you want to see pictures of everyone on this list all in one place, please check out my Pinterest board. In addition, there are more on my Pinterest board than are listed here due to finding out about more in recent news stories or research. This entry was posted in Uncategorized and tagged bipolar disorder. 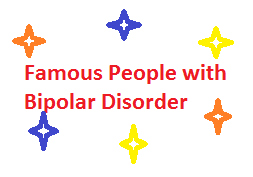 mental illness awareness, depression, famous people with bipolar disorder, mania, mental illness. Bookmark the permalink. Great post, celebrities are definitely a big influence on public perception of mental illness and awareness-raising.